It was the first snow of the year in Seattle, so I sent the drone up for a look around. Most of it was blown away by high winds yesterday, but it’s still cold. Seattle is Seattle somewhat snowy and mostly cold. I’ll ride in most any condition, but not black ice. That didn’t stop other cyclists, 55 were counted on the Spokane Street Bridge. It’s not that cold, but it’s a wet cold…deep in your bones cold. If I was in Park City, or any other dry climate, I’d ride a fat bike for sure. And, good luck to those that did venture out. Keep the rubber side up. The thing about modern cycling is it’s a 4 season sport now. The gear, bikes, and all are so good….there’s little to keep you from riding, except the black ice. Much has improved since I wrote about the snow for Wired. That includes access with destination grooming trails for cyclists, like the Methow Valley. Fat tires open up new possibilities and in the years since the niche first emerged from Alaska, the product has only gotten better. Manufacturers have pretty much decided on a width (4.8″ wide), lightened up the bikes, and tightened the geo so they ride less like monster trucks, and instead like a regular old mountain bike with moto tires. 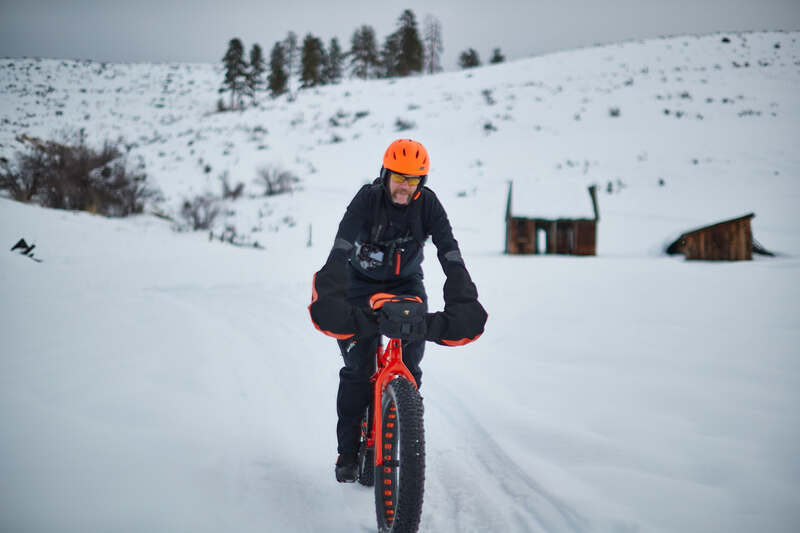 Fatbiking in the snow is like any other snowsport. Your fun is entirely dependent on the conditions. It can be crusty and perfect or greasy and frustrating. You should totally try it. This nice man here, David Atcheson, maintains the trails for Methow Fat Bike and works at the shop with Treks.